Katakana is one of the two Japanese 'syllabaries', the writing systems used to represent the sounds of Japanese syllables. (The other is hiragana.) Katakana symbols are used to spell out words phonetically, especially non-Japanese terms. The term katakana is usually written in katakana - as カタカナ, but it originally comes from 片仮名, which means 'fragmentary kana' - most of the characters are fragments of more complex kanji with the same reading. If you are just starting out with your Japanese studies, you should learn hiragana first. Once you have learnt hiragana, learning katakana is a great second step. Study katakana now: use QUICK TEST to find out what you know. Hone your writing with DRAWING PRACTICE then study with free FLASHCARDS. When you are ready, take the Kanshudo katakana CHALLENGE. Kanshudo flashcards are free to use, but you need to be logged in to the system. Please LOG IN now. If you have not yet registered, please REGISTER. It's free, fast and easy, and brings many benefits in addition to the flashcards, including lessons, favorites, and the Daily Kanji email. The basic katakana chart is as follows. The 'dakuten' symbol ( ゛) and the 'handakuten' symbol ( ゜) are not used on their own - they are used to modify the katakana symbols they appear after. When ゛is displayed after another katakana symbol, it indicates that the symbol should be 'voiced'. 'Voicing' is a linguistic term for a sound that makes the vocal cords vibrate - as opposed to just emanating from the mouth. In Japanese, this means that the sound of a consonant moves further down your throat. So, for example, the unvoiced sound カ (ka) becomes the voiced sound ガ (ga). When ゜is displayed after a katakana symbol, it changes the sound to a 'p' sound, so for example, ハ (ha) becomes パ (pa). The basic katakana can be modified in a couple more ways. Katakana ending in 'i' can be followed by a small ya, yu or yo (ゃ, ゅ or ょ), which elides the sounds of the two characters. For example, キ (ki) plus ヤ (ya) would become キャ (kya). This type of modification is known as 'yōon'. Finally, a small tsu (ッ) can be used between two katakana to double the second consonant. For example, サッカ is read as 'sakka' (author). This is known as a 'sokuon'. To learn the katakana, there is no substitute for lots of practice! Practice your recognition with flashcards (use the link at the top of this guide), and use this section to practice drawing. Most importantly of all, practice using katakana in context by reading Japanese sentences whenever you can. 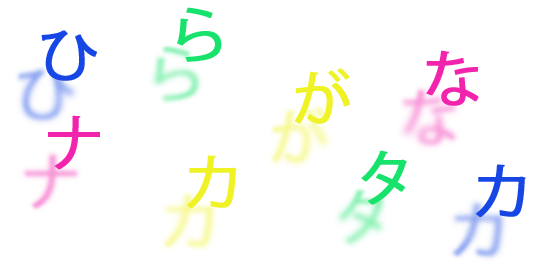 Use our Katakana Drawing Practice, or practice any individual katakana by using one of the links below. Kanshudo is your constant companion on the road to mastery of the Japanese language. Check out our many features.